For our first maker collaboration, we are so excited to introduce you to Mary Lou Bingaman of Perennial Shop. 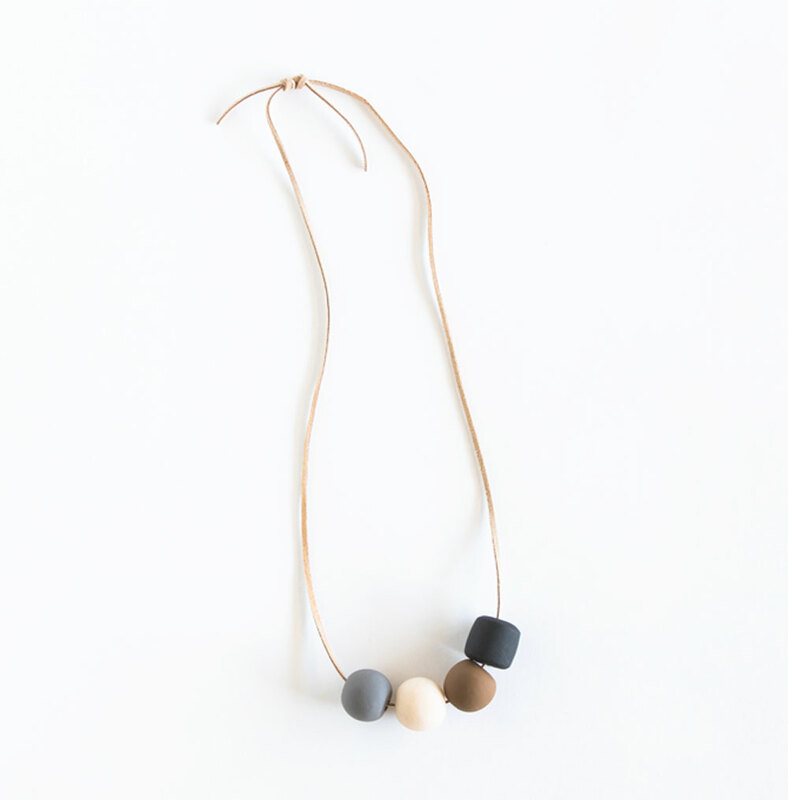 Her handmade clay necklaces have been the talk of our little town for a while now. Each of her necklaces are hand-made and thoughtfully designed. Her soothing color palettes reflect that of her sweet nature and easy going personality and she puts her heart, creativity and talent into each piece she makes. We were so excited to collaborate with her on an exclusive American Native x Perennial Shop design for this Fall/Winter season. We focused on a deep navy with a beautiful marbling that we thought reflected both of our brands. We also changed up her classic horseshoe shape for a wider shape - one that gives a unique look and feel, a subtle change from her statement style. Our personal favorite feature (on all the necklaces) is the adjustable strap. You can wear it long or short depending on the look you’re going for. This exclusive style, along with the rest of her line available on our site, is the perfect statement piece for your wardrobe. I was born in Dallas and grew up in a surrounding suburb. The U of A brought me to Fayetteville – and it’s been home ever since! Apart from the wonderful people I’ve come to know and love here, Fayetteville has shaped my career goals and encouraged me to give this small business thing a go. The small business community here is really unique and supporting of those trying to hop in. I got into jewelry making my freshman year of college by just messing around with clay and different beading styles. I’ve always been the type to be inspired by something, try to find a way to gear it towards my own style and make it more affordably. What inspired you to start Perennial Shop? Perennial Shop started after getting a lot of good feedback whenever I wore the things I’d made around friends and at work. While I’m still figuring out this whole business thing, small businesses around me inspired the small and gradual growth of Perennial – rather than having to have it all figured out on day one. The most rewarding thing has definitely been seeing people love what I’ve poured hard work into – especially those who have zero connection to me as a person. It’s always fun seeing strangers wearing my clothes and necklaces. Most challenging part – capitalism. I still have a lot to learn. Tell us something we don’t know about jewelry making. This is maybe not about jewelry making at large, but a peak into my process - There’s a lot of time that goes into each piece. It all starts at the drawing board, continues to the trial and error stage and is likely worn around to get some feedback. No machinery used- all drawn out, formed and tied by hand. I’m constantly inspired by companies that don’t choose to sacrifice the well being and empowerment of people, long lasting design and quality work or the sake of profits and exposure. Each of my pieces is carefully hand crafted and personally designed. I’m passionate about working with my hands, and it’s a privilege to be able to pair that with design. I’ve always been a fan of versatility. I love adding things to my closet that can be worn with many different things on many different occasions. I try to maintain that in jewelry design too – pieces that can work across your wardrobe! Inspired by versatility and minimalism that allows for versatility. -There is a lot of thought put into how each piece is designed – jewelry and clothing alike. -I am truly so appreciative of those sporting around Perennial necklaces and clothing. This is a one-woman show and the support means so much. -Open to custom pieces! Getting to know my customers a little more through that process is something I love doing. What are your long term dreams with Perennial Shop? A dear friend of mine and I have been dreaming for quite some time about the future of Perennial looking like a lot more clothing designs and a lot more hands looking to learn a trade. I want to bring more passions and more people into the whole equation. I’m excited to see how this little business evolves!